1.7.2.3 is a hotfix for 1.7.2.2 in which there were PDF issues under Linux which are now fixed in the 1.7.2.3 release. Also, there have been some optimizations to the project loading speed. Thanks guys! Installed on Ubuntu 14.04 without trouble. Installed on Mint-17 Cinnamon 64 without a hitch and as near as i can tell it fixed the 1.7.2.2 issues I was having. It is a joy to use this new Scrivener release. Thank you for not only giving us the new release, but also for quickly giving us the hotfix 1.7.2.3. As always, you guys are the greatest! Can't wait for the retail version! Thanks for supporting Linux! Just installed 1.7.2.3 on Mint 17 and it's working great. Hi! Brand-new user here; thanks for making a Linux version available! I ran through the tutorial today and encountered a couple of issues (some minor, one that consistently produced segfaults). I also tested against the Windows version to see if the same behavior was present there. If these have already been reported, sorry for the duplication. Part 11: Scrivenings - multi-document select doesn't seem to work; the editor shows only a portion of the most recently shift-clicked document, cutting it off on the right as well (screenshot); if one scrolls up with the mouse wheel, all the selected documents are shown (screenshot), but then the mouse wheel only scrolls the particular document under the pointer. If your mouse has a horizontal scroll wheel, it will also scroll the document under the pointer left or right within the visible area. (This issue does not occur under Windows.) 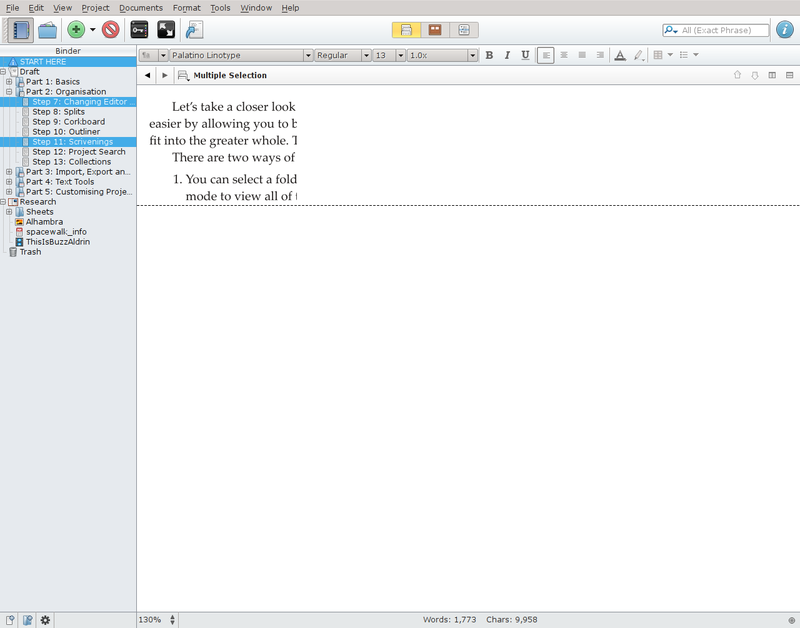 Scrivenings mode for a folder (e.g. "Part 2: Organisation") does not produce this behavior, and works as described in the tutorial. I was using the 1.7.2.3 64-bit version under Ubuntu 12.04.4, and 1.7.2.0 under 64-bit Windows 7 Professional SP1. Anyway, just from going through the tutorial, this seems to be a fantastic piece of software. I've just purchased a Windows license (order ST[...]1178) to support further development of Scrivener, but if anyone's keeping track of your potential Linux customer base, please let him or her know it would have been a Linux license had they been available. Opened it up and all the projects worked just fine. I've brought up the tutorial, but not too much farther. Hope this helps. This old laptop is my "travel" laptop for more challanging environments and temporary writing. Normally, I use my Scrivener Windows version on my "real" laptop. Thanks to the developers making Linux possible! Just downloaded and installed on Mint with no problems. Opens and saves scriv files. More testing to come. Have been running through the tutorial. Looks good! I really like the approach. b) scrivener crash in ubuntu 14.04 when dragging items in the binder, and the unity launcher comes out from the left side (also reacting to the drag event). But not every time - maybe it is not related to the unity panel? Confirms the report from another user above this post. The file exists, I double checked. f) to zoom a pdf: maybe there is a problem with non-english keyboard: using ctrl+- works fine for zooming out, I'm not able to make ctrl+= work (not quite sure what key combination I need to use). Regards, and thanks for a brilliant piece of software. Successfully installed on Debian 7 amd64! 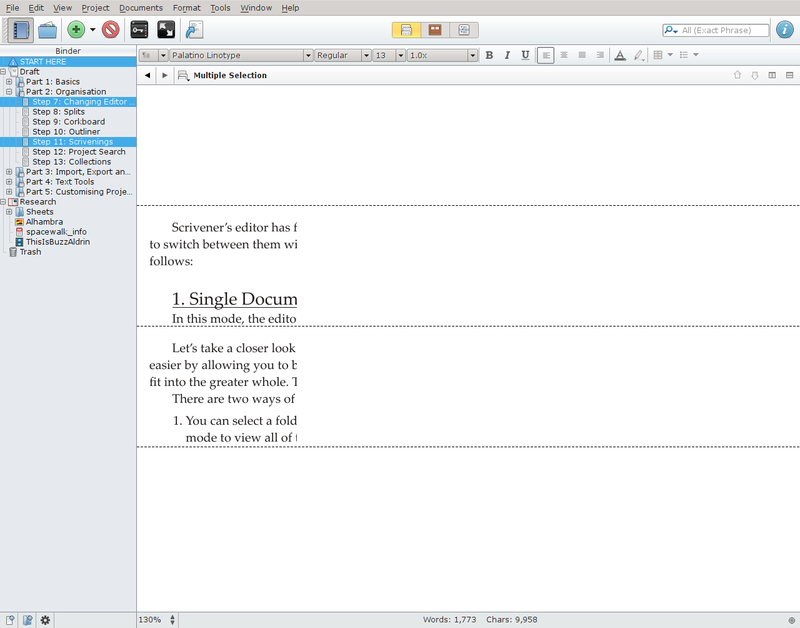 reinstalled Scrivener... happy writing time! Ubuntu 12.04 runs libc6 2.15 as stable. I'm wondering if that distro was used to configure this Scrivener package. Thanks for doing what you do so well! I'm brand new to Scrivener but have been wanting to try it for a while... The release of a Linux version means that I finally can - hooray!! This is a really impressive beta but there are a few problems I've found and I hope reporting them here is helpful. I'd like to confirm that I expeirenced the exact same behaviour as JohnSmallBerries on Part 11: Scrivenings .... I found that Scrivenings is fine if selecting a whole folder, but if I select an arbitrary list documents then it shows them in a column that's about a quarter of the screen width of the document screen. No asterisk on References button in Step 5 (Adding a reference doesn't change the icon either) - Oddly this started working after restarting scrivener so maybe it's intermittent. 5e Keywords and in other places the tutorial says to click on the "triangle" to expand things like folders but in the Linux version at least it's not a triangle - it's a + or - in a box. Part 3 Step 16 Compiling - Compile dialog blocks the main document dialog. Cannot scroll through tutorial steps while using Compile. Cannot access text colour or highlighting colour options. Clicking the "A" or Highlighter Pen buttons shows a very brief flash of the palette but no possibility to choose a colour. (Highlighter has default colour of yellow which can be set by single clicking the icon, but changing the colour is impossible). Unable to import DOCX / ODT (and probably others).... "Error: Format Converter not found"
Scrivener has crashed on me several times - Notably when dragging items around in the binder as reported by another user, but also when I clicked on 'Research' in a new,empty project after deleting some blank documents from failed imports. I discovered Scrivener yesterday and feel like I've found a new world. I can't remember being this excited about a computer since I borrowed the use of my flatmate's machine to write my dissertation and he explained copy and paste to me. I want to say thank you, but I'm so happy with it I would also like to pay. I feel it deserves money and chocolates and flowers and a warm man hug to really labour the point of how happy I am. When is it likely that Scrivener for Linux will go commercial? I want to support it. Failing that, could you set up a donations fund? I'd offer to help if I could, but I've ground to a halt on the Edx Linux for technophobes course, so I can only cheer you on. Installed perfectly on Kubuntu 14.04. I would like to ask for some help or an insight for an inconvenience that I am having with Scrivener 1.7.2.3. When I use Scrivener with English (US) keyboard layout, all keyboard shortcuts work fine. Things like Ctrl+C,X,P,Z (also Ctrl+Shift+Z) do work as expected. Ctrl+I,B,S (Italic, Bold, Save), Ctrl+Shift+B,I,R (Toggle Binder, Inspector, Ruler) do not work. These are only the ones I've tested. Some of the non-working keyboard shortcuts could be reassigned easily. Things like Ctrl+S,I though are almost hard-coded in my muscle memory and I am having a hard time writing, Does anyone have the same problem? I tried different settings in KDE's System Settings without any luck. Scrivener is the only application in which I seem to have this problem.